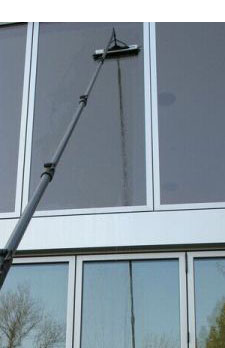 With almost 20 years of experience and expertise we have developed a high quality, thorough and efficient commercial window cleaning service which is capable of dealing with every type of business premise, including: office buildings, multi-residential properties (nursing homes / sheltered accommodation), retail and commercial properties. We combine traditional methods along side innovative state of the art 'reach and wash' system technology to ensure that our customers receive a safe quality solution. As members of the Safe Contractors Scheme we are able to reassure our customers of the professionalism and skill of all of our operating staff. Our 'reach and wash' system allows us to clean windows, upvc facades, glass roofs, panelling and cladding in excess of 65 feet without the need for cumbersome ladders, cherry pickers or cradles. Each of our vehicles carries a specialised purified water system which includes the lightweight telescopic poles and soft brush attachments which enables us to access the inaccessible. Operated by our highly trained and professional staff our system cleans without the need for added chemicals ensuring an environmentally friendly solution to daily grime. It is cost effective with the minimum of health and safety issues, and guarantees privacy for the customer without the intrusion often associated with alternative methods of access. In the event that we are unable to access your windows with our 'reach and wash' system technology, we will use access plant, like a cherry picker or lorry mounted plant to complete the clean. We aim to ensure that our customers are fully satisfied and the use of access plant does still have a key role to play in window cleaning. 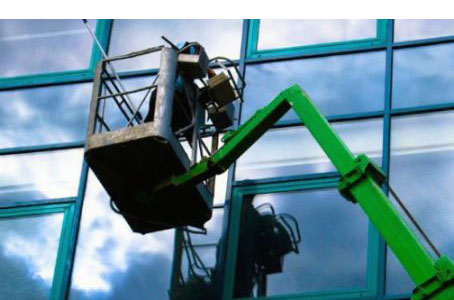 With the use of access plant and our highly skilled operators who are all IPATH trained, we are able to reach heights in excess of 33 metres (110ft) to ensure that our window cleaners can provide our customers with a thorough service.